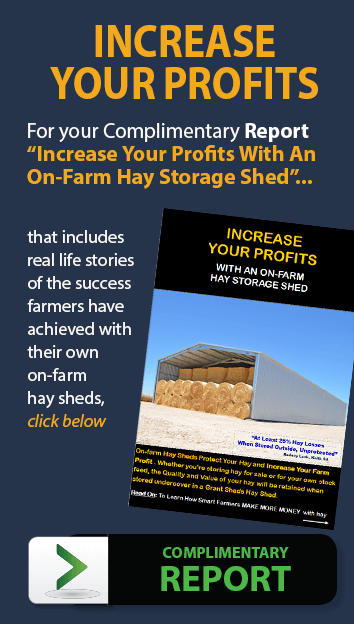 HAY SHEDS – So You Can Retain The Quality & Get The Best Prices! 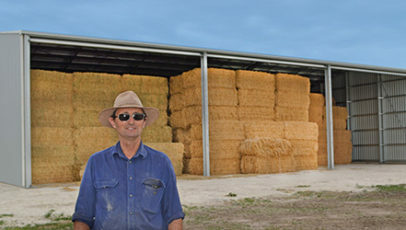 To get the best profit from your important hay produce, it must be stored under cover to protect the colour and quality. Without this, the price you’ll receive, or the nutritional value for your stock, some months after harvest and baling, may fall dramatically and adversely affect your farm income. 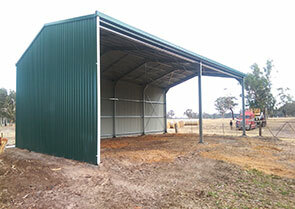 12m x 24.3m x 6.3m Hay Shed with 3 x 8.1m beams. Ideal for large bale storage. 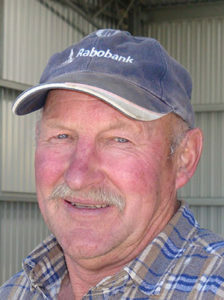 And Rodney chose super-strong UB columns to prevent tractor damage if bumped during loading and unloading. 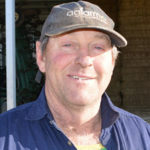 As a hay producer you invest an enormous amount of time, money and effort into producing quality hay. 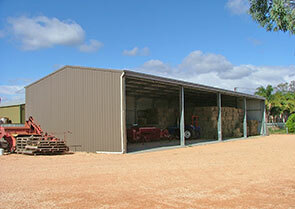 Selecting the right shed to store your valuable produce is therefore important to prevent spoilage through weathering. After all the expenses and efforts of producing your crop, you can’t afford to allow your income to drop because you didn’t protect it until sale time. And if you don’t store it under cover, you may be forced to sell your hay immediately after baling at just whatever price you’re lucky enough to be able to get at that time. 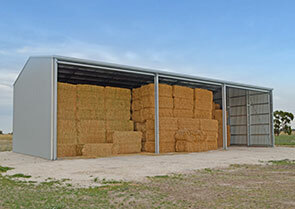 Hay storage sheds give you the much better option of storing your hay, safe in the knowledge that it’s protected so that its quality will not drop. 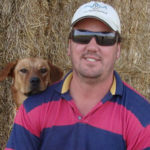 Then you have time to concentrate on other farm harvest matters and can do your hay sales and marketing when the spring-summer harvest rush is over, with time to thoroughly research your hay selling options to get the best, premium prices. for your family and farm income? 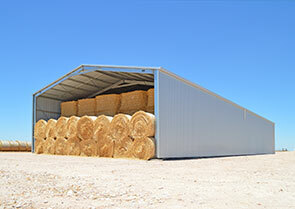 Grant Sheds has a huge range of high quality hay sheds for large or small hay bales and for any quantity. 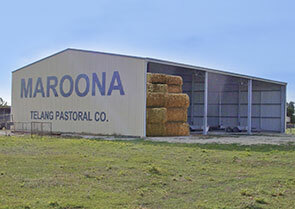 They are perfect for export quality, large bale hay which needs to be stored undercover to retain quality and colour to get the best export prices. And also for your own domestic needs, covered hay retains quality for longer storage life and better nutritional outcomes for stock feeding. Our experienced shed builders can travel to you to erect your new shed so that you don’t have to worry about the hassle or inconvenience of building it yourself or finding your own shed builders. Having said that, our sheds have been designed to be easy to build. So if you know a local builder or you’re happy to build it yourself, you’ll certainly be glad you invested in a Grant Sheds hay shed. The time you’ll save over many others will be dramatic. 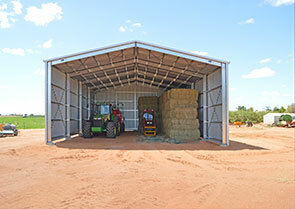 If you need a huge hay shed, in sizes up to 30m x 150m x 8m (100’ x 500’ x 25’) or if your need is just for a small hay shed for your own on-farm hay needs, Grant Sheds can build you the shed you need. There is a very wide range of sizes to make the best use of your storage space. 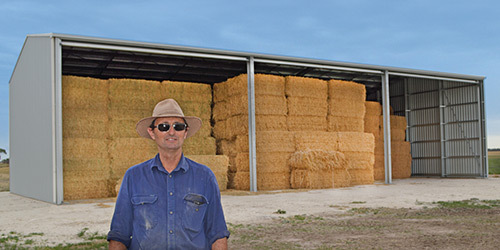 The size and number of hay bales you will be storing, is considered to give you advice on the most economical hay shed for you. Ultra-strong UB (universal beam) columns. 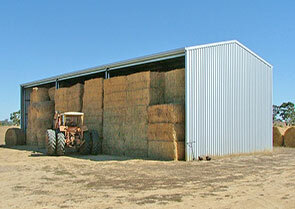 On-farm Hay Sheds Allow FAST storage of hay at harvest time. 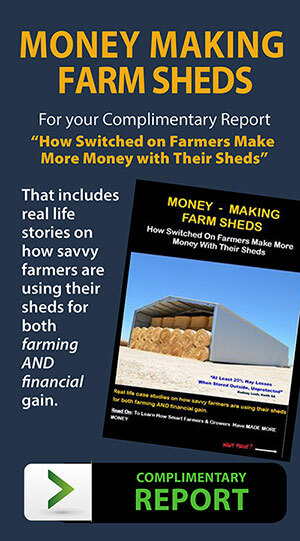 This reduces harvest stress and allows savvy farmers to increase their hay profits by selling when prices are best. = Dramatic increases in PROFIT! 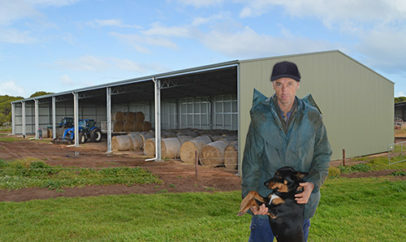 New tax depreciation measures, that include sheds used for fodder storage, me an that you may now be able to claim depreciation on your shed over just 3 years instead of previously up to 50 years. See below for further information. 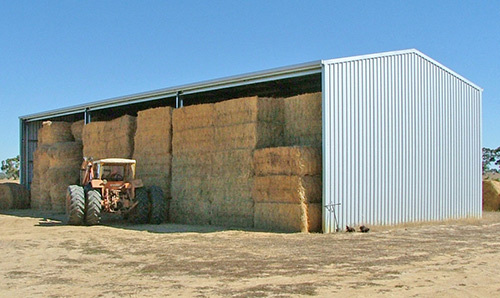 Hay sheds are available in a wide range of styles and sizes. Sheds that are open ended or open on one side are the most common, but Open both ends, enclosed one end &/or one side, or roof only are all available as well. Most popular and price-efficient is 5.1m or 6.3m. The height range is almost unlimited. Most common is up to 8m high. 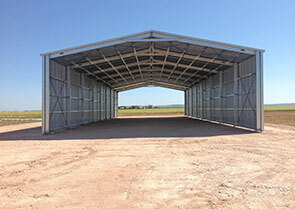 Beams to provide wide bay openings are available in 6m, 7.6m, 8.1m, 9m 12.3m and 12m widths. UB Columns Universal Beam (UB) front columns instead of C-section is available if preferred. This option may prevent column damage, caused by inattentive tractor driving, when filling or unloading bales. UB Columns & OWJ Roof Trusses Framing that is made of Universal Beam (UB) Columns and Open Web Joist (OWJ) Roof Trusses are also available in the larger spans and heights in this hay shed range, if preferred, and may be recommended where the hay shed is in the larger span, taller heights and wider beams of this range. We know this becomes confusing, so please just discuss your needs with us in terms of the approximate size and/or quantity of bales you need to store and allow our team to guide you to the most suitable and cost effective shed design for you. Virtually unlimited height range, with most popular being in the 6m – 8m height range. A wide range of beams to provide wide bay openings are available to suit your bale sizes and personal preferences. Some prefer as few front columns as possible, while others prefer to compromise by having more front columns and less cost. 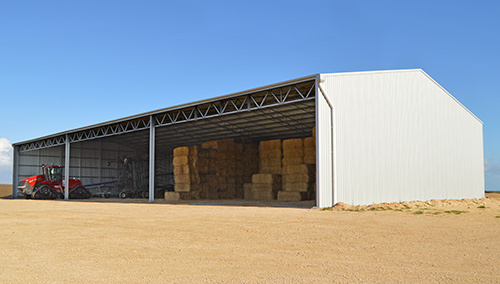 Framing that is made of Universal Beam (UB) Columns and Open Web Joist (OWJ) Roof Trusses are generally used in this MEGA hay shed range. Other sizes and styles available on request. 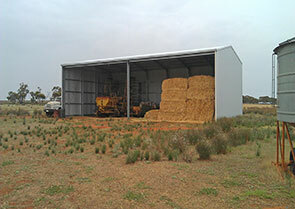 If you require a customised Hay Shed to suit your own specific needs, please contact us and our helpful and experienced team will be happy to help work out a size and layout to suit you, based on your needs. Shown here with Colorbond cladding. Open one side, 2 x 9m beams. 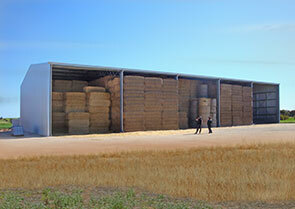 16.2m bays to economically store vast numbers of large bales with as few columns on the open front as possible. 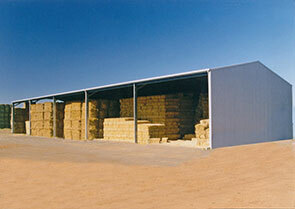 Improves accessibility and reduces chance of damaging columns during loading and unloading your hay. 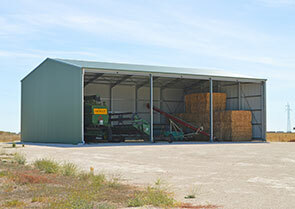 Pictured here is a shed with 8.1m beams which are ideal for storage of 3 large bales, without wasting space. 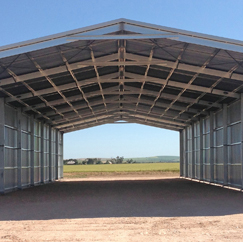 The investment in your new “Aussie Tough”, Grant Sheds Hay Shed will vary depending on the size, construction style, accessories required and the location of your farm. Please inquire and we’ll discuss your needs with you, help you work out what might suit you best, and then we’ll be able to generate proposals that will suit your specific circumstances. 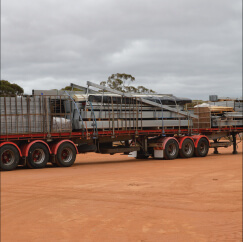 In 2015 the Federal Government announced new tax depreciation measures for primary producers. It opened the door for farmers and other primary production businesses to claim accelerated depreciation on fodder storage infrastructure (amongst other items). 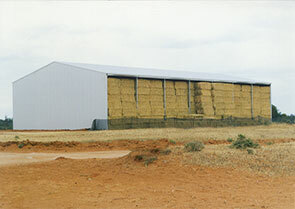 This includes sheds used for fodder storage. Under these new measures, primary producers can deduct the cost of fodder storage sheds over just 3 years! This is instead of up to 50 years previously. It’s not just those who are classified as a small business. 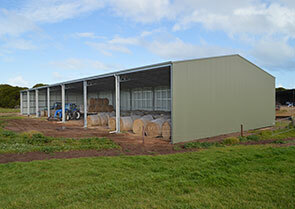 And there is no restriction on the value of your purchase on these sheds for fodder storage. “We recently had 170kph winds and we lost the roof off my super shed but this one’s still standing and it’s open into that wind. Grant Sheds were good. Contact was easy and they always returned phone calls or emailed and sorted out my needs quickly. Delivery was organised easily and everything was packaged nicely. The builders did a good job. They were in and out in just 5 days. There were no hassles and I was happy to watch them do it. Neil invested in 3 Grant sheds because he was so happy with each one. Plenty of hay storage space in this massive hay shed. And Sam wouldn’t go anywhere else for his next shed. 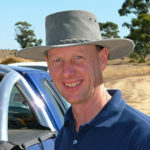 “My experience from Grant Sheds has been first rate. You were extraordinarily approachable through the whole process… everyone made it extremely easy. You obviously have confidence in your product so that you don’t need to be high pressure salesmen. I really appreciated the fact that I wasn’t being pressured into something. It’s been excellent. A very enjoyable process. And it’s a magnificent shed. MEGA HAY SHED: 16.2m wide span beams fit 6 x 2.4m long bales in each section for very efficient return on investment. “An excellent, well made shed. Braced to perfection. I just wanted strength where there’s activity in and out. Whether you are ready to get your new shed started right now, or you still need help to plan one that suits your own specific needs, we’re ready and willing to help you in whatever way we can. Choose from the selection of contact methods below and we’ll help you take your next step.